Mix bajre ka ata, salt, required water and knead into medium soft dough. Heat mitti ka tawa. divide the dough into 2 equal portions and roll into balls. Flatten it and spread into small thick roti. place it on the mitti ka tawa and cook on medium heat. keep aside. Prick the brinjals and roast them over open flame or in preheated oven until skin scorches and starts peeling off and the brinjals start to shrink. let them cool. remove skin and mash it. Heat water in pan, once boiled, add tomato, cook for 3 to 4 minutes. Keep it out side. let it cool, peeled and chop tomatoes. Keep aside. Heat oil in kadai, sauté garlic paste, ginger paste. add onion, sauté for 2 to 3 minutes. add chopped tomatoes, cook for 4 to 5 minutes. add spring onion green leaves, mix well . Add salt, red chilli powder, coriander powder, turmeric powder mix well . add roasted mashed baigan, mix well. cook for 6 to 8 minutes. 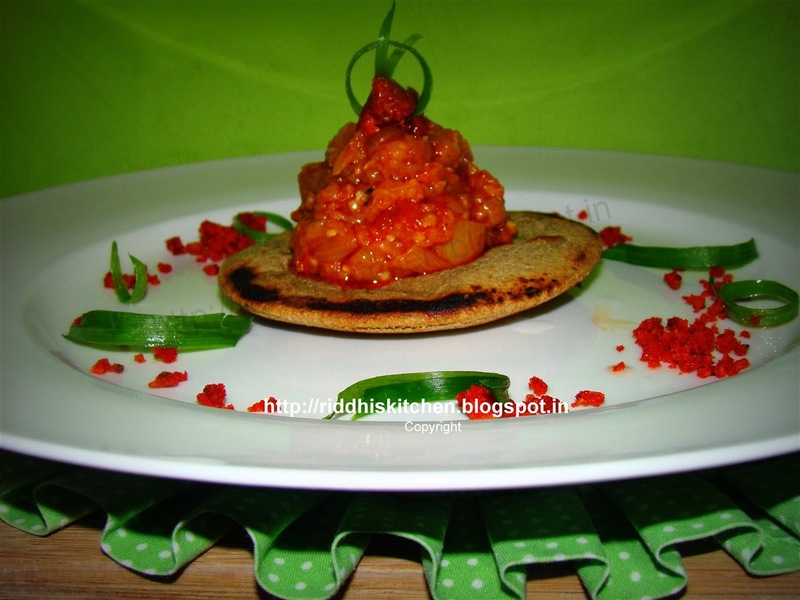 serve baigan ka bhartha with bajre ki roti, Dry red garlic chutney .